Do We Need to Lock Down When We Power Up? I am finding myself agreeing with their reasoning. My wife and I have even discussed purchasing a simple eReader for my son. He’s an avid reader, and the idea that a book is only a click away would seem like a great way to encourage this essential skill and habit. It would be a part of his larger literacy diet of both paper and digital text. But once the technology starts coming in to school, how do we ensure that these tools are safe from damage or theft? In my school, we don’t lock the lockers. Thankfully, theft isn’t an issue I deal with often in my K-5 setting. But we are not talking about securing nominal items. These devices are significant investments, financially and in their child’s learning. Some schools have a form that families must sign before bringing the tech. It absolves a school of any liability in case of lost or stolen items. With more families requesting that their kids bring their digital tools to school, this is something I am going to have to employ pretty soon. But they are also requesting that these tools stay secure, including putting locks on the lockers. My biggest issue I have with this is the message this sends. 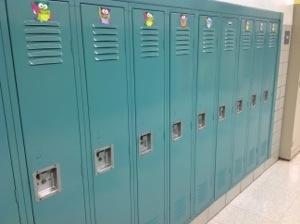 Locks on the lockers may convey a lack of trust. We are in an elementary school! This is not considering the more practical issues, such as how to conduct a locker search in a timely manner. A rare occurrence, but something else to consider. As you can see, I have many more questions than answers. With technology continuing to become cheaper and subsequently more ubiquitous, I’m sure other elementary leaders have similar concerns. I hope that any readers here might share the wisdom of their experiences in the comments. This is the second year of BYOT in a title 1 elementary school. You will not believe the array of devices that show up at school. The major problem is that many of the cheaper and older devices will not get on our network, something about wifi cards etc. Apple devices seem to work better than android on our wireless system not sure why. Going to have to learn how to use it. Stan, thank you for sharing your thoughts. I agree that the engagement factor of tech is something we need to harness in our learning environments. Doing it in a way that will augment our instruction is the goal. Previous Previous post: Where Do Learning Targets Come From?